I was unfamiliar with the word "muffaletta" a mere five months ago. I was sitting at a table in Jason's Deli, probably munching on a spinach veggie wrap (my favorite! ), when I spotted a photo of a scrumptious-looking sandwich. 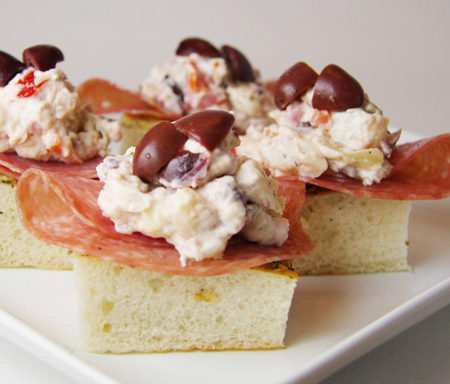 Layered in between the bread were olives, cheese and layers of sliced meat. Yum! The next time I was there, I ordered one of those delicious sandwiches all for myself. Actually, I ordered a quarter of one because the whole sandwiches are enormous. It was olive-y and gooey and fabulous! Since then, I have been extra aware of my newly-learned word, muffaletta. I saw a recipe for muffaletta dip as I flipped through a magazine a few weeks ago and knew that it had to be made soon. Like the sandwich, it was olive-y and gooey and fabulous! Rinse and drain pickled vegetables. 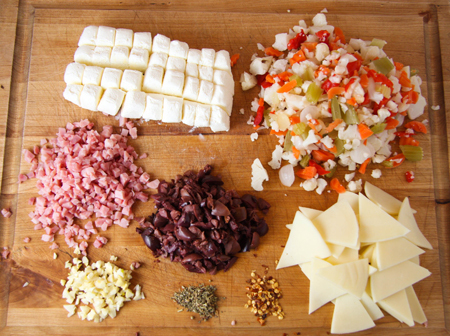 Remove stems from peppers; chop vegetables. 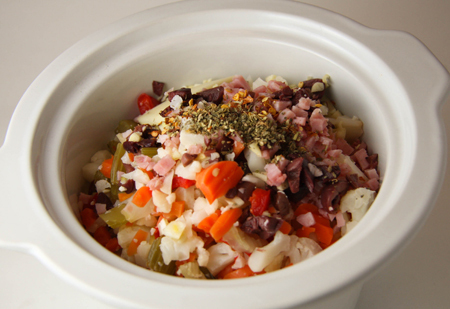 In a slow cooker, combine pickled vegetables, cream cheese, provolone cheese, ham, olives, garlic, Italian seasoning, and, if desired, crushed red pepper. Cover and cook on low-heat setting for 2 to 3 hours. Stir until cream cheese is smooth. Stir in enough milk (2 to 3 tablespoons) to reach dipping consistency. Serve immediately or keep warm, covered, on warm setting or low-heat setting for up to 2 hours, stirring occasionally and adding milk as necessary. 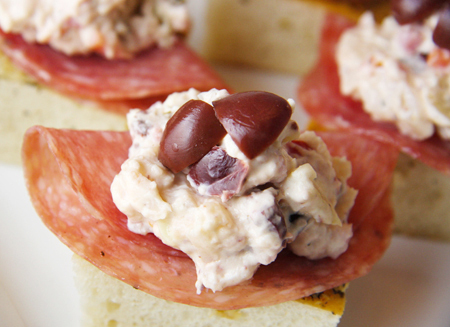 Serve with salami on toasted bread.